Tayler Malsam will be behind the wheel of the Turner Scott Motorsports No. 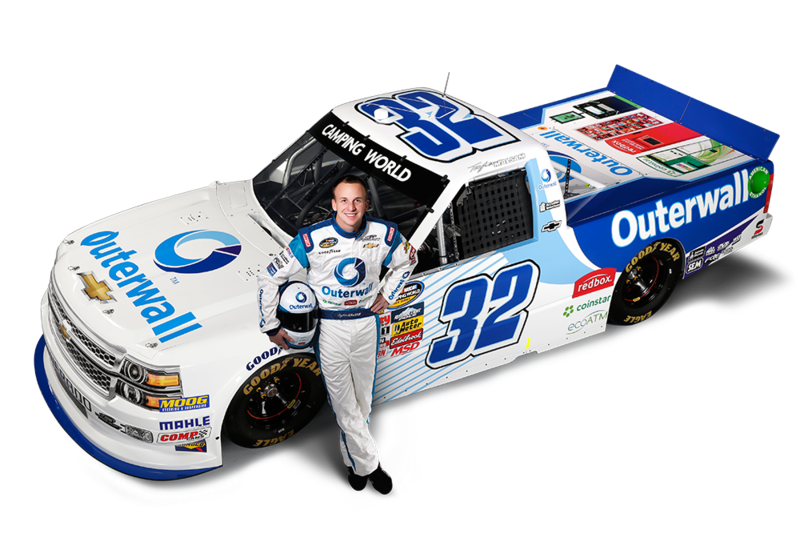 32 Outerwall Inc. Chevrolet Silverado in12 NASCAR Camping World Truck Series races through the remainder of the 2014 season, beginning this weekend at Kansas Speedway. The 25-year-old made his NCWTS debut in 2008 and competed full time in 2009, where he garnered 10 Top-10 finishes and ranked 12th in driver points. A native of Seattle, Washington, Malsam began racing go-karts at the age of 16 and quickly progressed to the ARCA Racing Series, where he ran a full season as a Penske Development Driver. While competing in the NCWTS for Kyle Busch Motorsports in 2010, Malsam got a midseason opportunity to advance to the NASCAR Nationwide Series with Braun Racing, where he ran 11 events for the now-Turner Scott Motorsports team. Malsam embarked on his first full-time NNS season in 2012 with TriStar Motorsports and ranked 15th in the Driver Point Standings. Currently, Malsam is competing in sprint cars and will balance both racing schedules throughout the 2014 season. "It's great to be back in the NASCAR garage and back on track with the Truck Series," said Malsam. "I can't thank Outerwall and Turner Scott Motorsports enough for their support and for giving me this opportunity. Mike (Hillman Jr.) is an accomplished crew chief and I think, together, we can get the Outerwall Chevy Silverado in victory lane this season."